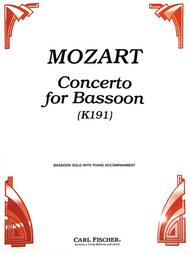 Concerto for Bassoon (K191) (Bassoon Solo with Piano Accompaniment). Composed by Wolfgang Amadeus Mozart (1756-1791). For Bassoon Solo, Piano. Solo part with piano reduction. Standard notation. K 191. 16 pages. Published by Carl Fischer (CF.CU731).ISBN 0825827671. With Standard notation.